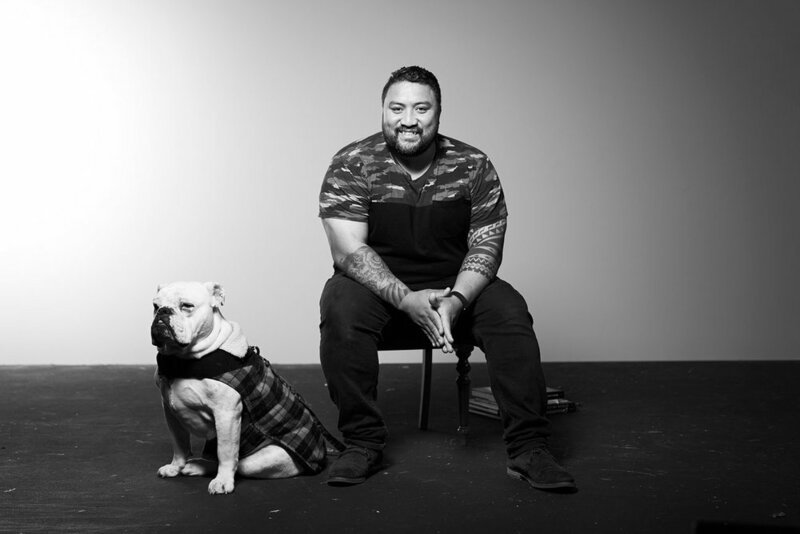 "MUSIC IS ALWAYS AROUND US, JUST NOT NECESSARILY IN ITS ORGANISED FORM"
Mapping Creative Hustle is a series of interviews with creative entrepreneurs connected to the Māngere Ōtāhuhu area. The interviewed were conducted by Ema Tavola with portrait photography by Vinesh Kumaran. The answer to that continues to evolve, and I often fight against it because I used to feel like I had to stay within a box, to keep doing the things I had done that I knew worked. But I’ve always wanted to explore new things, and that’s a scary place to be sometimes, but the more that I embraced it, the more projects and opportunities, and money, comes through. So these days, I just make things, I used to want to box it into ‘I make music’, but now it’s about exploring how music fits into our lives. Or just the way this primary discipline of mine, and the creativity within that, applies to other things. It broadens out so many other avenues which I’m currently exploring, which are both ticking the creative box and also bringing in money. I make things for a living, primarily in the digital interface - music as a digital recording as opposed to live performance. Nowadays, this medium lends itself really strongly to video, visual storytelling; people kind of see music more than they hear it these days, so it’s a big mish-mash of stuff. There’s that creative itch that never gets satisfied, and each time you finish something that you think is really cool, you always wonder what the next thing will be. Curiosity! You grow up wanting to figure things out, but once you do, then you’re looking for the next thing to figure out, and it’s sometimes hard to do the same thing twice. It’s a never-ending creative avalanche, constantly going on these tangents and parallels. Then it’s aligning it with the opportunities that allow you to be responsible and pay the bills, and so forth. To this day, my Dad still gets up every morning at 4.30, goes to work in the factory, comes back home at 6.30pm. It’s that whole story of ‘they did it so we could have a better life’, and it’s a fact that I get to live a creative life now because of him and my mother’s sacrifices. For me, the creative industries are now the factories, they put in all the factory hours to grant me these opportunities to grind away in the creative industries. I know a lot of people do feel entitled to funding mechanisms or whatever, which does serve a much needed purpose and specific function, but to me, its bonus, it’s just amazing that it’s even possible to create things let alone get paid for it. Same grind, different factory. So, if I feel myself slacking off, I feel like I’m not doing justice to the sacrifices that allowed me to be able to even talk about this stuff. Have you had an epiphany that has led you to this path in life? I have epiphanies every time someone pays me to do something that doesn’t feel like work. I was on the 2012 trip to Sāmoa with Prime Minister John Key’s NZ artist delegation for the 50th Independence celebrations; I don’t know how I ended up on it, but I was tripping out at the fact that people were paying me to go there, and make beats! I’m from the hood so I didn’t know who Fatu Feu’u was, or Lonnie Hutchinson or the other five artists. I’d be listening to them talk about these projects like designing an actual bridge, or selling a painting that paid half a year’s bills, and I’m thinking, they’re doing what they love, and it’s their passion. It was seeing the examples of others doing it. Growing up seeing your parents slaving away doing manual labour that pays the bills, you’re told you have to go to school, you have to go to Uni. But seeing these artists doing their thing at such a high level, it made me think that if I work really hard at what I do, it can generate money, and be sustainable. That’s a reoccurring epiphany that I get on every job where someone is willing to pay me to do something that I love. I’ve always made beats, I’ve always been tutu-ing with gear, then you have a physical, permanent version of that idea, and that fascinates me. So, now people just pay me to be creative; I just want to ride this wave, it’s cool. If there was one thing you could outsource to help you do more, or be more effective, what would it be? It’s quite specific in terms of what I do; a lot of the post-production, in terms of mixing down music and cutting visuals is just set-up and loading files. I mean, it’s a luxury that the top engineers have assistants that prep the sessions and they literally just come in, turn on their ears and everything’s already loaded up, so all they’re doing is levels, levels, cue pan and boom. Being that we’re working artists, we’ve got to do everything ourselves; there’s always the technical side and the creative side, I’d love to outsource some of the technical, but that’s a bit of a luxury these days. Some projects allow budget and scope to do that, but in a perfect world, I’d love to be able to outsource whenever I felt like it. On different projects you sometimes want to get involved in different parts of the process. Some projects feel specific, wanting to oversee the planning and set-up, or the actual production, or editing, or post-production. On other projects you just want to do the creative stuff. Some projects I might take on more so for a unique technical challenge. Generally, I prefer the creative side as opposed to the technical, and it would be great to have someone to do the boring set-up stuff. It’s kind of like gigs; people want to perform, but nobody wants to pack up. For Auckland Arts Festival project I did this year, 4 Tha Lumana’i, they gave me some assistants for whatever I didn’t have the capacity or interest to do myself, to make it easier. It provided for more creativity as opposed to committing too much energy on the technical side of things. And those who were engaged in the technical areas had a million questions about the creative side, which is great. It should be an educational experience. What is something you wish you could do/find locally that would support you as a creative entrepreneur? Any time I’m engaged on a project, and there’s something that I don’t know, it’s a big opportunity to explore and find out something new. I’m always interested in what my own version of an answer is, as opposed to just trusting answers that might be readily available. I guess that’s a hip-hop thing, where you want to customise the process to however you see it. One thing I’m actively trying to do a lot is put a spotlight back on traditional or indigenous Pacific music and instruments, because Pacific music in this day and age is usually overwhelmed by contemporary commercial music forms. But, if where we live is this hub of Pacific people with clear connections to where we’ve come from, where are our instruments and sounds? I feel like there’s not a lot of readily or easily accessible information or networks about our indigenous music. There’s information online and in archives at museums etc, but I’ve often found that when people need specific things, like say a log drummer, we often have to step outside of the ‘music’ industry to find it. Our indigenous instruments and sounds definitely don’t seem to have the same validation or spotlight within the ‘music industry’ context as it does within say the museums and fine art scene. So things like that aren’t streamlined and I think they should be. What do you wish you could change in societal attitudes that would enable you and other creative entrepreneurs to thrive? A general belief that I’ve been challenging in a lot of recent work, is that within the bigger world of music, is the subset world of sound. Being around creative’s from outside of the music industry, I’ve started to view it the other way around; that music is the subset to the bigger world of sound. That music is always around us, just not necessarily in its organised form. That opens up so much opportunity to the way you can view and create with sound. That general philosophy has allowed me to create a niche within my creative entrepreneurial practice; I’m no longer just doing music production, but rather sound production. It’s the bigger world: the roar of the ocean, the twigs snapping; those sounds have always been performing. Music as we know it, this R&B and hip-hop, which is currently so dominant, is merely a phase of us activating time, space and technology. So, that’s something that I’m striving to put a spotlight on, and it’s such a huge avenue for more entrepreneurship and more exploration. I just wish there was more of an appreciation in the wider community about the wider world of sound, as opposed to just the world of music. What do you love about living and working in the Māngere-Ōtāhuhu area? It sounds typical but, it’s the people. I’m so proud because of the legacy that’s come beforehand. We’ve got such a proud tradition that’s been established here by way of our sports people and musicians, and I always add that it’s not only about carrying on traditions but also calibrating traditions. We have to be part of the tradition; educating ourselves on the many strands that have come before us, but also adding our own strand to the collective, and by doing so, becoming inherently responsible for what we hand on, to do it justice; it’s that feeling of belonging. I’ve recently come back from Savai’i, and that’s home, but I didn’t grow up there, and Māngere is kind of all I’ve known. 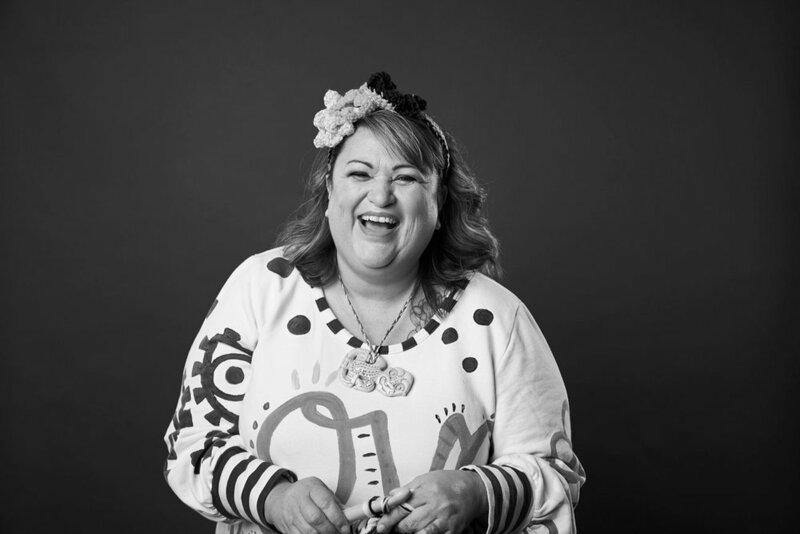 It’s those formative years, that urban Pasifika, that legacy of South Aucklanders that have come beforehand; getting to be a kaitiaki of it all, that’s such a cool thing. Would your work or practice be different if you lived somewhere else? Yeah, for me it’s having something to push up against, it’s when two things come together and there’s some kind of action and reaction, that’s the creative catalyst. I’ve been fortunate to get out of the hood quite a bit and travel, and getting introduced to other people and art forms that I wouldn’t normally experience in my usual reality, that’s why I feel real fortunate to have made the things I’ve made and think the way I do. If I was just in Māngere, I feel I’d make predictable things that just sit in a box, or I would cater towards the box of the ‘industry’. But because I’m Māngere-raised, and have also gone on to be exposed to all these other art forms, experiences and weird stuff, things that push up against the inherited South Auckland way of viewing the world, that’s where my creative catalyst is. Earlier on in my career, I’ve also helped create a lot of music that, I wouldn’t say I’m morally proud of, but that a lot of other people have placed value on, like some of the most gangster songs this country has ever put out. Within certain communities, my skills are validated but I don’t grow from it because, it’s preaching to the converted. But when you step outside of your box, and you work with an orchestra, or you take real life Ōtara gangsters and put them on the stage with the orchestra, you barely get a quarter of that same validation, but you know you’ve moved the conversation forward, and that can’t happen if I just stay within the box of the local music scene or street scene. So, for me it’s always been about being exposed to things outside of here, that’s definitely something that I feel sometimes doesn’t happen enough with the local scene. It’s definitely that concept of time and age and getting older; the more you discover, the more you realise you haven’t discovered, and the less time you have to do the discovering. That’s pretty much it for me. Time is definitely something that motivates me; that realisation of mortality, that you don’t have forever to make all the things you want to make. It also goes back to what I was saying before: this is the new factory, every generation has a responsibility to move our communities and our family legacies forward, up a level. Is it harder to crack the music slash creative industry… or barely having anything in Sāmoa and being told to come to New Zealand with no English, set up the family, look after the family back home, build the church here and back there?… which of the two is harder? I feel like there’s no contest. I have to crack this, if this is what I’ve chosen to do. I could have kept the factory narrative going, I could’ve gone and done something I didn’t want to do, but I felt like I’d made the commitment to do this, and I already am able to do this because of the sacrifices that have come beforehand. So, it’s not an option; I have to make this work because our parents had a much harder job than us. The fact that I happen to love this work is both a bonus and a blessing.